Solanum dulcamara, an aa kent as pushion berry, mad dug’s berries, puir-man's-wather-gless, is a species o vine in the potato genus Solanum, faimily Solanaceae. It is native tae Europe an Asie, an widely naituralised ensewhaur, includin North Americae, whaur it is an invasive problem weed. ↑ Sp. Pl. 1: 185. 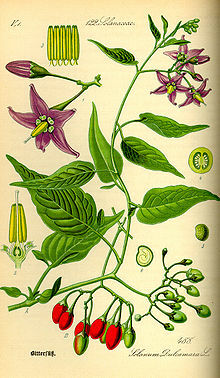 1753 [1 May 1753] "Plant Name Details for Solanum dulcamura". IPNI. Retrieved December 1, 2009. This page wis last eeditit on 12 Apryle 2017, at 17:44.